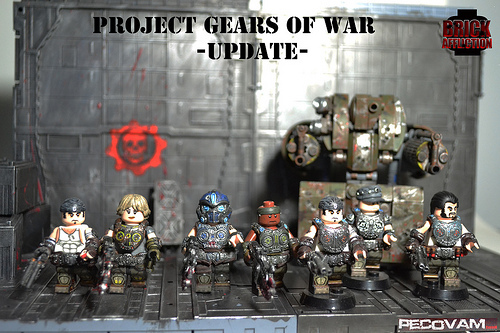 We’re sure that Marcus Fenix and Dominic Santiago would be proud of all the custom LEGO models and minifigures inspired by the gritty, complex world of the Gears of War video game series. Check out Armadillo APCs, Lancer rifles, and squads of Gears ready to take on the Locust horde. Organizers for the 15th Interactive Achievement Awards approached Alex Kobbs back in October to create a montage of the top video games of the year, animated in LEGO. Alex used clips from some of his earlier animations, including the super-awesome Gears of War 3, and a whole batch of new animation to create the opening sequence shown in Last Vegas earlier this month. And don’t miss Alex’s making of video. 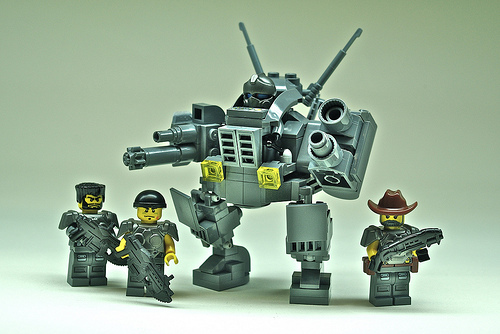 Though I prefer to earn my experience, medals, and achievements the old-fashioned way, I never cease to be impressed (and mildly amused) by those who design LEGO robots to accomplish their video game goals. Guy Himber built a robot to get the Onyx Active Reload medal in Gears of War 3 (watch him get the medal). Meanwhile, Justin built his own robot to max out his restoration level to 100 in Skyrim. What do you think? Fair play or hax0rs? After I posted my little fleet of microscale spaceships in September, I kept tinkering with the design of the ships, and when I got bored, built new ones. By BrickCon, I had added a new cruiser and hospital ship. 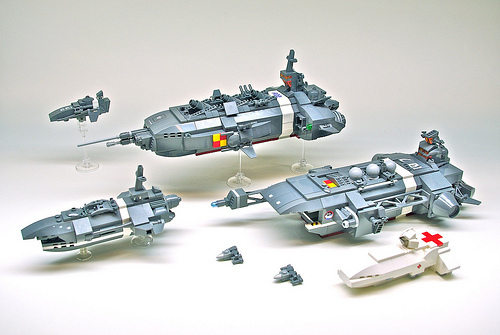 The cruiser is based on the same keel as the carrier, but the most notable improvements overall are the little bits of light gray, red, and yellow, plus the decals. Exo-Force sets provide a remarkable diversity of military/industrial designs on clear sticker sheets that add cool details to a finished model. 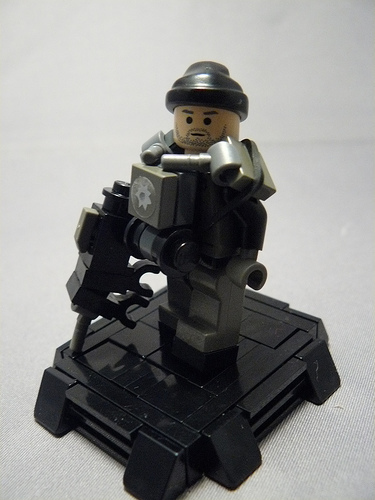 For the minifigs, I’m trying out the new Gears-inspired armor and weapons from BrickWarriors. Their lineup doesn’t currently include a non-retro Lancer rifle or Gnasher shotgun, so I’m using the old Amazing Armory versions. 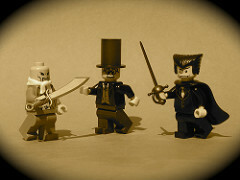 As my contacts on Flickr will already have noticed, I’ve been posting custom minifigs fairly regularly over the past few weeks, but haven’t posted anything about them here on The Brothers Brick. That’s because I’m approaching our review of the latest custom accessories a bit differently from the reviews we’ve posted of BrickArms and BrickForge in the past. Our past reviews have taken somewhat of a purist approach — using nothing but items from one custom accessory creator. But I believe that the accessories LEGO fans have created to work with LEGO are best when they’re used together, so that’s how I approached the minifigs in these photos. Still, each custom accessory vendor deserves their own review, so read on for my take on all the recent minifig accessories from Arealight, BrickArms, HAZEL, and Minifig World. 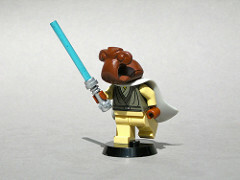 LEGO customizer Bluce Shu goes by Arealight online, and has been selling resin-cast accessories from his Bricklink store for some time. I’d never seen any of Arealight’s items in person, but I hadn’t been impressed with the quality of the resin-cast stuff I’d seen from other customizers. When my batch of Arealight accessories arrived in the mail, though, I couldn’t have been more pleased. 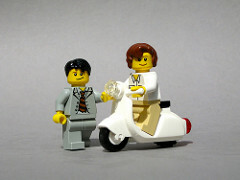 True, some of Arealight’s accessories don’t have the same tolerance as official LEGO elements — the hair doesn’t fit quite as perfectly and the headlight tends to fall off my Roman Holiday Vespa unless I twist the clear piece just right. There are also minor imperfections that differ from item to item. Surprisingly, I’m willing to dismiss these quality issues because they just give the accessories a charming, handmade feel. And because Arealight creates accessories unlike all others — Ithorian heads, Mandalorian armor, Vespa scooters, wavy capes, and more — I haven’t had so much fun building custom minifigs in a very long time. For more photos, see my full photoset of Arealight accessories on Flickr. One reason we didn’t do the full review of 2009 BrickArms accessories we’d promised is that the quality of Will Chapman‘s prototypes has improved so much that many of the released items don’t differ substantially from the preview versions we’ve already highlighted here. That’s a great thing, but it makes a review seem a bit redundant. Nevertheless, the latest BrickArms weapons include the wonderfully designed Lewis gun and Bazooka, as well as the much-anticipated MGL and combat shotgun. 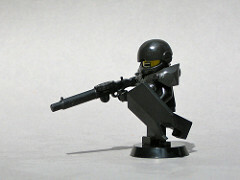 The quality and playability are nothing less than we’ve come to expect from BrickArms. As always, Will is cooking up new prototypes in his garage. The “photon pistol” is lovely in the hands of my Star Trek minifigs, the buildable ammo chain has infinite uses, and the “buzz gun” looks awesome. History buffs are sure to be pleased by the Browning Automatic Rifle. 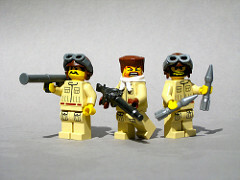 See lots more photos of past, current, and future BrickArms accessories in the full photoset on Flickr. Custom accessory creator HAZEL is fairly new to the LEGO scene, first posting custom samurai on Flickr less than a year ago. 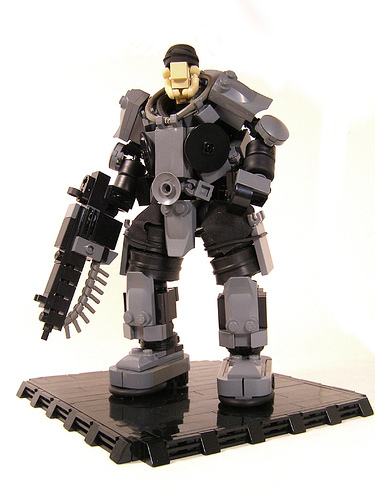 It wasn’t until he posted a batch of minifigs decked out in armor and weapons inspired by Gears of War that the customization community really took notice. 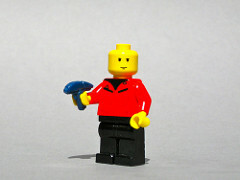 There was clearly demand for these items, and HAZEL soon had a Bricklink store up and running. Unfortunately, HAZEL disappeared from the online world just around the time I thought I’d buy a few items to review for the blog. With a string of negative feedback on Bricklink, I looked elsewhere, and ended up buying my HAZEL accessories from Custom Minifig Shop in the UK. Prices were about the same as directly from HAZEL, and shipping to the US was also reasonable. As it turns out, HAZEL was in a horrible motorcycle accident and has apparently been in the hospital for a while. 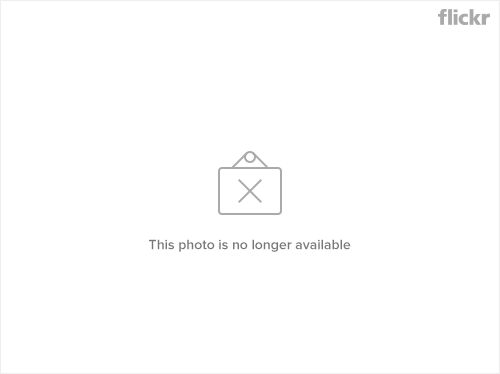 He recently posted again to Flickr and promises to make good on his overdue orders. Why is all this relevant to my review? Because it’s important to remember that you’re often buying from a single individual with a side business, not a big corporation. The custom accessories themselves appear to be resin-cast like Arealight’s. The texture isn’t perfectly smooth, nor the black a perfect match with LEGO, making these ideal candidates for further customization through painting. Having no talent in that area, I prefer my own accessories ready to use. Still, HAZEL’s accessories are great fun and a nice match for mecha pilots, post-apocalyptic survivors, and other sci-fi characters. 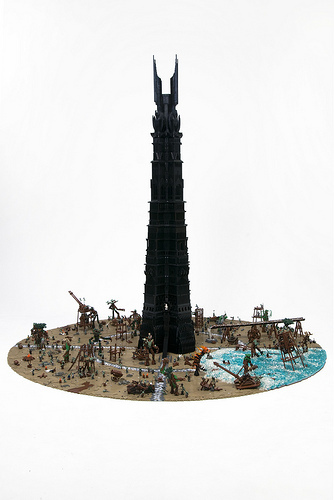 Unlike the weapons, headgear, and other accessories we’ve reviewed so far, Minifig World produces display stands for minifigs. The stands have two studs for your little plastic friend’s feet, as well as holes on the underside for stackability. 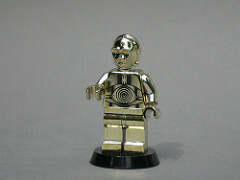 Minifig World stands are excellent for showing off your minifigs, like that super-rare chrome-gold C-3PO. HAZEL burst onto the scene with a Gears of War APC we featured less than a month ago. 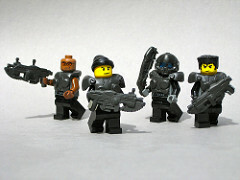 HAZEL’s latest batch of creations includes a set of absolutely amazing custom LEGO minifigs inspired by Gears of War 2. Tai Kaliso, Marcus Fenix, and one of the Carmine brothers are all decked out in custom armor and weapons created by HAZEL. I can’t wait to see what this master customizer will cook up next! 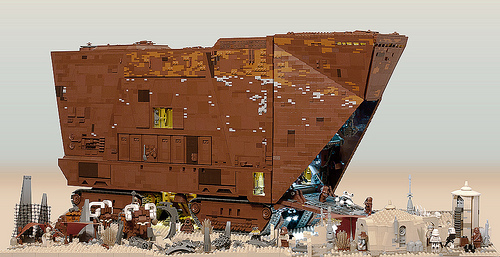 One sure way of attracting my attention to your LEGO model is making it look bigger than it is. HAZEL-Fantasy (HAZEL-頑張ります!) 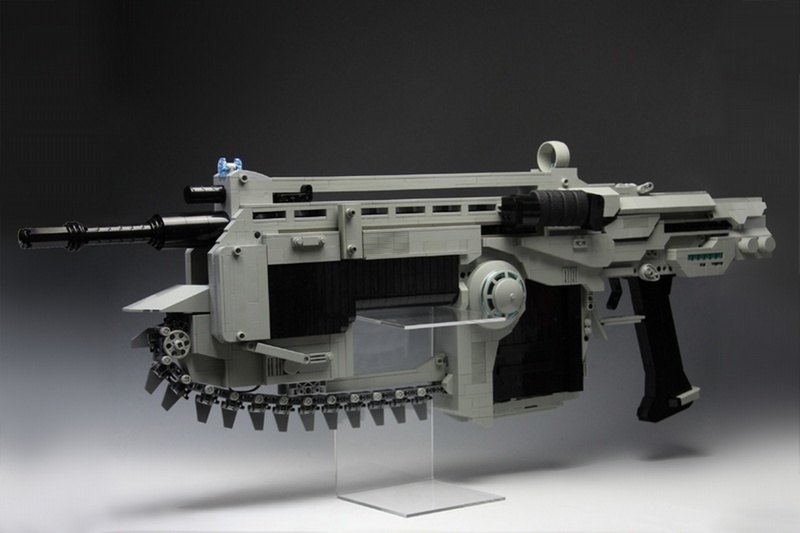 has created a version of the Gears of War APC that’s well-crafted, detailed, beautifully curved and small. I’m quite blown away. 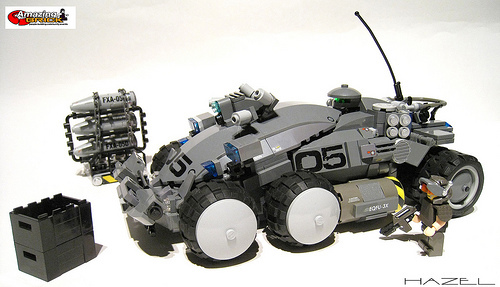 It’s also nice to see a model of an APC that isn’t the (very cool) one from Aliens. Everybody loves Gears of War! As demonstrated above, Chuck loves Gears of War. Legohaulic loves Gears of War. Alex Peacock loves Gears of War. I love Gears of War. Hurray for Gears of War!